Looking at this chart, what I think you would see is that unionization levels have a strong relationship to progressive taxation. New York, Hawaii, and Washington are all high-tax states, especially on rich people, while the non-union south has generally low levels of taxation and regressive tax structures. The conservative movement is financed by rich people whose primary interest in life is lower taxes. And on an intellectual level, the main wellspring of conservative economic policy ideas comes from people who believe that progressive income taxes are very economically damaging. A secondary intellectual inspiration is people like Greg Mankiw who believe that such taxes are an immoral imposition on a genetic elite. A key problem with this agenda is that higher taxes on rich people are a politically popular way to solve budget deficits. The solution is to create a dynamic in which political parties are entirely reliant on rich businessmen for their financing. 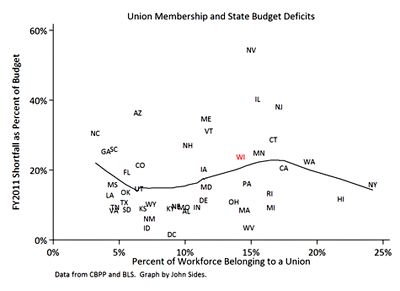 Reducing labor unions to a state of political impotence will get the job done. Italics mine. Needless to say, for more on this you should read my piece about the role of unions in the American political economy, which went online today. It’s good! I promise.